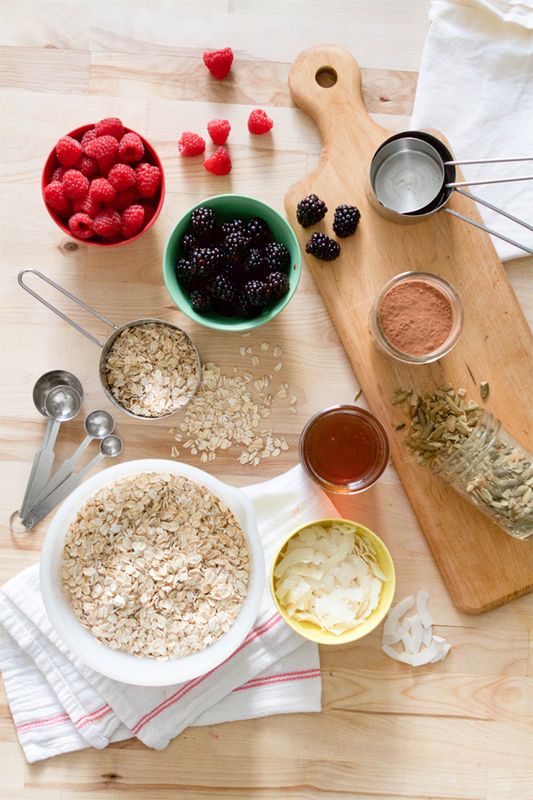 We’ve partnered with The Quaker Oats Company to bring you a few easy breakfast recipes to simplify your morning routine. Last week we shared this healthy waffle recipe. 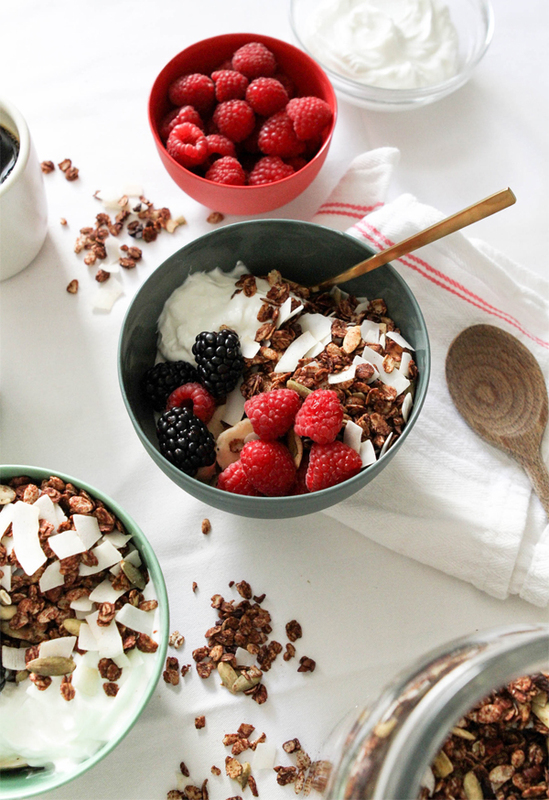 Today, we are excited to bring you a delicious granola recipe. I love making a big batch and then having it ready to go for quick mornings. This recipe is great for busy families because you can make a huge batch at the beginning of the week and eat a bit each morning. 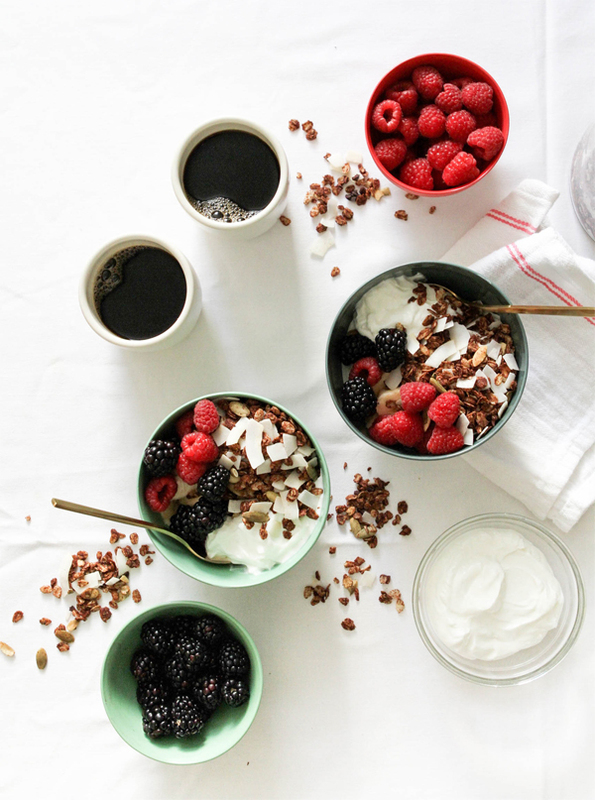 We add a little yogurt and berries (although it’s good enough to eat plain too) and it keeps us full. In a small saucepan, combine coconut oil, cocoa, honey, and salt. Bring to a simmer over medium heat, whisking occasionally. Simmer and whisk for 2-3 minutes, until well combined and glossy. Remove from heat and add vanilla. 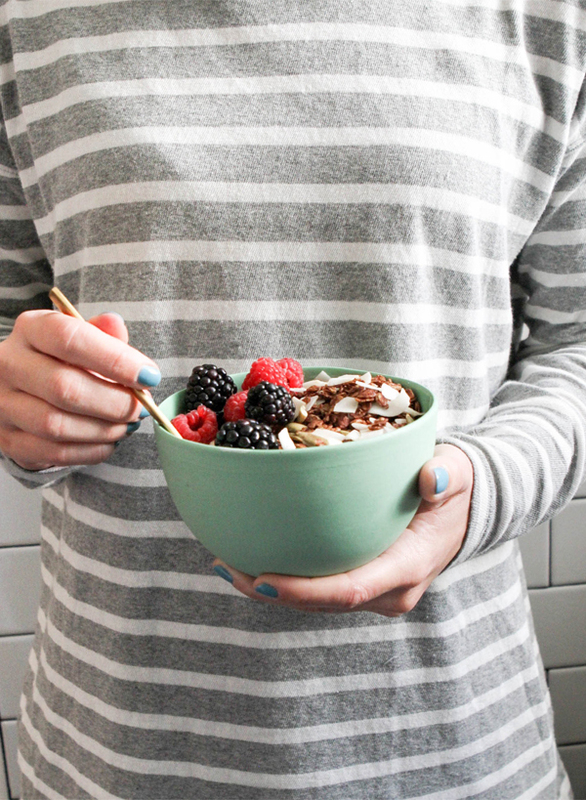 In a large bowl, stir together oats and crispy rice cereal. 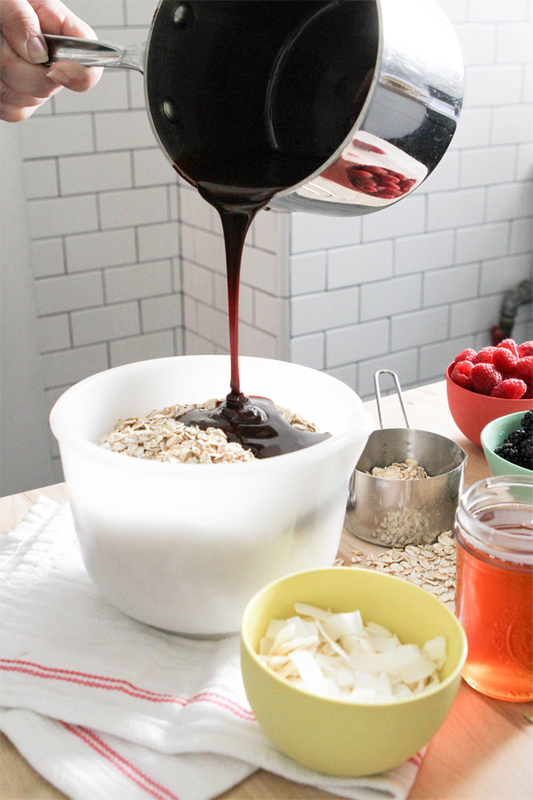 Pour in cocoa mixture and stir with a rubber spatula until oats are well coated. 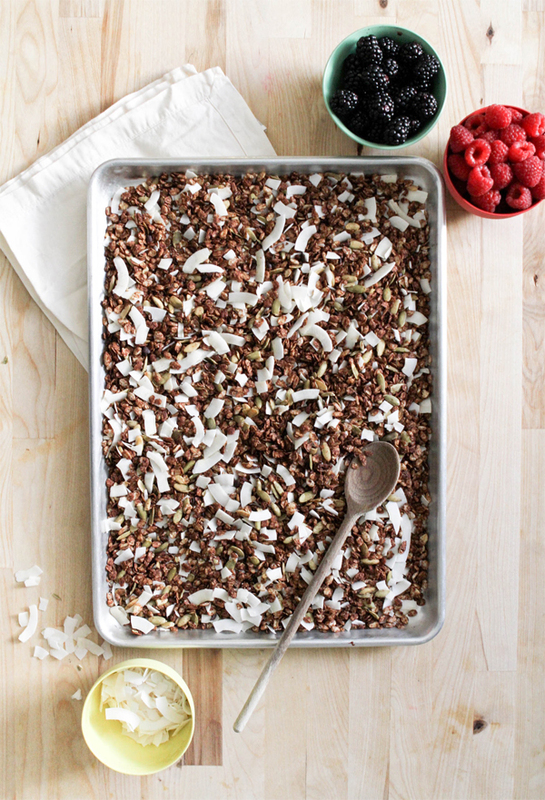 Fold in coconut chips, pepitas, and cacao nibs. Transfer to a baking sheet and spread into an even layer. Bake for 45-50 minutes at 275 degrees, stirring twice during baking time. Turn off oven and allow granola to slowly dry and cool in the oven, about 1 hour. Serve with greek yogurt and fresh fruit. Extras can be stored in an airtight container for up to 3 months. 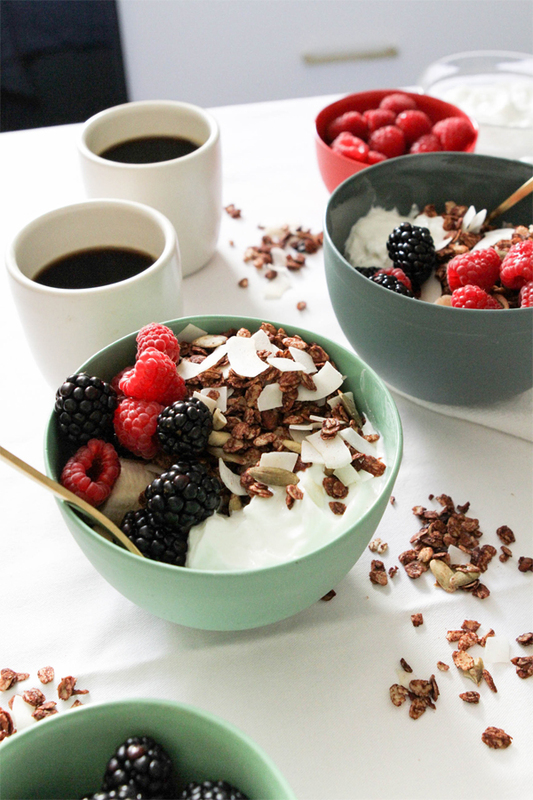 For more recipes and tips like this for simple efficient morning routines, click here! This looks amazing. I really prefer to do all my weekday cooking on the weekends (#NotaMomYet) and this recipe would be perfect to have in my fridge all week. That looks so awesome and delicous! I need to try this! Hello yummy! What a delicious looking recipe! 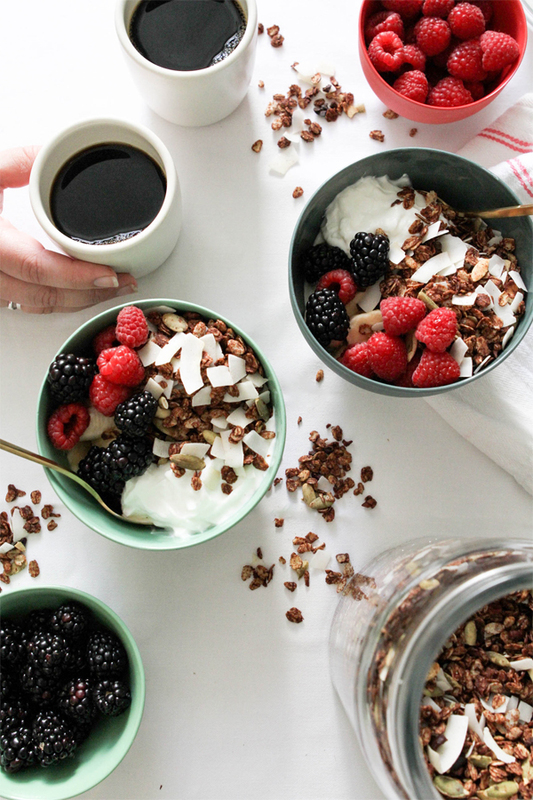 This granola looks amazing! I need some in my life asap. Looks delicious! What temperature is the oven supposed to be on? Sorry about that! We updated the copy. 275! YUM! this reminds me of my childhood. Will try whipping up a batch soon. This looks so delicious and it is really easy to make!I am so impressed and at the same time jealous about your pictures they are perfect!!! Yum ~ need to try this out! Thanks for sharing this recipe!